After abandoning their primitive settlement at sa Caleta, at the end of the VII century or the beginning of the VI century BC, the Phoenicians founded Ibosim, the origin of the present-day city of Ibiza. The place chosen by the first settlers to found their new colony was the Vila hill, a place that dominates the bay, that was surrounded by walls to protect them from the Greeks and the Romans. Ibosim was the first city of the Balearic archipelago, becoming one of the most important in the Mediterranean thanks to the maritime commerce promoted by the Carthaginian empire. The enclosure, Puig des Molins, considered to be the best preserved necropolis of Phoenician-Punic culture, dates from the same period. The third Punic war resulted in the destruction of Carthage and at the beginning of the II century BC Ibosim became a federate city of Rome, adopting the name Ebusus. During the V century AD, after the fall of the Roman Empire, the city entered into decadence and was conquered by the Vandals, afterwards by the Byzantines and at the beginning of the X century AD, became part of the Cordoba emirate with the name Yabisa. The Arabs rebuilt the fortified walls and settled on the island, contributing to its economic and cultural development. In 1229 King Jaime I conquered Mallorca and in 1235 occupied Ibiza in an expedition organised by Guillem de Montgrí. The city and the island became dependent on the Crown of Aragon and were repopulated by Catalans. In the XVI century, with the appearance of firearms and the frequent attacks by the Turks, King Felipe II approved the construction of a new wall to surround the city. The project was asked of Giovianni Battista Calvi and later modified and extended by Giacomo Paleazzo. Preserved until the present day, the renaissance walls have seven polygonal bastions and a ravelin. In the XVIII century, during the Succession War of Spain between the supporters of Felipe V of Bourbon and Charles of Austria to occupy the monarchy of the Hispanic Confederation, Ibiza was in favour of the latter. Due to this stance, the Bourbon troops occupied the city which resulted in the loss of the institutions of self government of the island and the ownership of the salt flats, one of the main economic activities of the era, that passed into the hands of the crown. The fortifications of the city of Ibiza, traditionally called Dalt Vila (Upper Town), have five entrances. The main one is the Ses Taules Gate, facing the fishermen's district of la Marina. The two Roman statues on either side of the gate are two reproductions of the original ones discovered during the construction of the enclosure and that are now preserved in the Archaeological Museum. Passing through the gatehouse leads to the Patio de Armas, a singular place with ten half point arches that for years was the site of the first hippy market of the island. From this point, and passing through another gate that is also adorned on the outside with a Roman statue, leads to the Plaça de Vila square. From here different routes can be chosen to get to know the enclosure. Amongst the different visits, not to be missed are: the bastions and the ravelin with the extraordinary view over the bay, the modern city of Ibiza, the En Bossa beach, ses Salines and the island of Formentera; the ancient convent of the Dominicans, now the Town Hall of Ibiza, where there are regular exhibitions and folk dances; the cathedral of Ibiza, initiated in the XIV century and ended in the XVII century; the Episcopal Palace, the Bishop's residence; the Archaeological Museum, situated in the old University building, the self government building of the island until its abolition by Felipe V in the XVIII century; the building of the Royal Curia, an institution equivalent to the present Courts of Justice; the Castle, the homage tower, the Almudaina and Governor's house, a group of military buildings situated in the highest part of Vila and at present under restoration promoted by the Ibiza and Formentera Council; sa Carrossa, a square where there is a statue of Isidor Macabich (Ibiza, 1883-1973), popular Ibizan priest and historian; the Contemporary Art Museum, situated in the old warehouse and arms room of the XVIII century; the chapel of Saint Ciriac, with an entrance that according to legend, the Catalans used in 1235 to conquer the city; the Seminary, ancient residence of the Jesuits and later Diocese Seminary, now reconverted into apartments; and l'Hositalet, an old church now adapted as an exhibition hall. Dalt Vila offers visitors many other attractions, such as the numerous bars, restaurants, shops and art galleries plus some small hotels, establishments that complement the wide variety of services in the popular fishermen's district of la Marina, situated between the fortifications and the port. 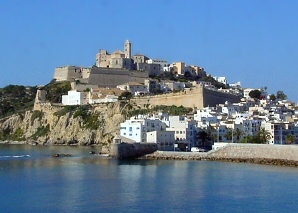 The fortifications of the city of Ibiza were declared in 1999 World heritage site by Unesco. This declaration also included the cemetery of Puig des Molins, the Phoenician settlement of sa Caleta and the prairies of Posidonia of the Ses Salines Natural Park. To celebrate this international recognition, the Ibiza Town Council organises in the second weekend of May a wide programme dedicated to culture and entertainment. Recently the city of Ibiza has entered the group World heritage Cities of Spain site, an association formed by the Town Councils of Spain that because of the singular historic, architectural and cultural values have deserved the recognition by Unesco as World Heritage Cities. Finally, mention must be made that the Ibiza Town Council organises regular guided tours through the streets of the historical Dalt Vila and the districts of la Marina and sa Penya.